North America’s best regarded consumer publication has rated Waste King’s higher end garburators (the Gourmet SS3300 and Legend 8000) as the best systems available (the Gourmet SS3300 was recently replaced with the Legend 3300). They were found to grind food faster and more finely than other garburators, minimizing the chances of jams or clogs. Their noise levels were also quieter than average. Compared to InSinkErator garburators, Waste King models generally have higher RPM motors. This is why they are generally better at grinding food, but also somewhat noisier. Higher end Waste King models include a stainless steel grinding chamber and grinding components, which makes them more durable than models with plastic chambers and galvanized steel grinding components. These models include a lifetime corrosion warranty. Waste King models also include the longest warranties in the business, with some models even including lifetime warranties. These are in-home service warranties, which means that Waste King will send someone out and replace it for free if necessary (so you don’t even pay labour). However, note that this warranty only covers manufacturer’s defects. It does not include drain blockages that the garburator fails to prevent, nor does it include normal wear and tear, jams, or other issues. The network of contractors who provide this service (who may not be the same as the installing company) might also change and service might not be available in your area. For these reasons, we suggest you mainly look at the warranties and guarantees offered by the installing company rather than the manufacturer. However, while we don’t recommend you assume the manufacturer’s warranty will cover required repairs, the length of the warranty is an indication of the units overall durability and reliability. More powerful units typically also have more durable grinding components and are suitable for grinding a larger variety of food waste. Some units have stainless steel grinding components, while some have less expensive galvanized steel grinding compontents. The stainless steel components are more durable, and will not corrode over time. Stainless steel units typically last longer. In the past, garburators were fasted to the sink adapter by 3 bolts. Now, garburators with a rubber attachment (called an “EZ mount” system by Waste King) are becoming more popular. While resulting in a slightly less sturdy installation, the EZ mount system is also slightly easier to install and enables a quicker replacement when necessary. The splash guard can also be more easily removed to allow clearing of the grinding components (if necessary- but be careful the power supply has been disabled when doing so). Since the slightly lesser support provided by the EZ mount system is rarely a problem, these systems have become more popular and are much more widely available. For this reason, we usually install EZ mount Waste King garburators. Batch feed models require a cap to be inserted above the drain before the garburator can be operated. This is useful when additional safety is desired, such as in homes where children are present (it also prevents the accidental dropping of silverware, watches, etc. down the drain which may damage the garburator or the items dropped). Waste King basically makes 6 different models of garburator. However, they each come in up to 3 different versions: an EZ mount version, a 3-bolt mount version, and a batch feed version. We currently install Waste King garburators starting from $199. See our online specials on garburator installatons. We are now installing Rheem Energy Star hot water tanks. These tanks have an Energy Factor (EF) of 0.69 for the 40 gallon model, which puts them ahead of most other Energy Star models (which are usuly rated .67 or .68). They are about 10% more efficient than standard new hot water tanks (which are usually rated at 0.62) and up to 25% more efficient than older tanks (which can be rated at 0.53 or less). Rheem also includes a 6 year parts warranty on functional components, in addition to their 8 year warranty against tank leakage. Most other water heaters only have a 1 year warranty on parts. When you install a new Energy Star hot water tank, FortisBC will give you a $200 rebate. This program has just been extended until December 31st, 2013. Right now, we also have an online special where you can save an additional $130 on a new Energy Star hot water tank (subject to end at any time). Also note that FortisBC rebates of $400-$500 on tankless water heaters and $1000 on condensing storage tanks are available. Learn more about these systems on our tankless water heaters post. When is it time to replace your old hot water tank? With some home insurance companies, if your hot water tank is over 8 years old, any water damage caused by leakage will not be covered. So this is when you should start to consider replacement. We estimate tanks last for 11 years on average (although this varies considerably). To schedule your hot water tank installation, call 604 GOOD GUY (604 466 3489) or use our online form. If your sink is clogged, there are a number of things you can try before calling a plumber. 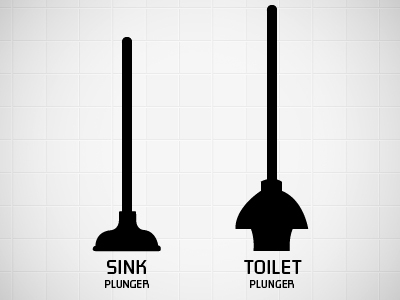 Many sink blockages can be cleared with a sink plunger. You can also use a toilet plunger if you push in the flange- but it will be more difficult to use and potentially unsanitary as well. It is easier to unclog a sink with a sink plunger than a toilet plunger. Image by Caitlin McCormick- Dribbble. When using a plunger, be sure to get a tight seal between the plunger and the sink, as this is necessary to create suction. Also be sure that the plunger is filled with water, as it can only create strong suction when acting on water, not air. You might have to refill the sink multiple times before you’ve cleared the blockage. Cover the overflow (the hole at the top of the sink) with a damp towel, so that pressure cannot be released. If it’s a double sink (as in a kitchen) you must also cover the second drain. It always helps if the sink is filled with hot water (but not boiling water, as you could burn yourself) since this can help soften up blockages. The below video shows how a plumber with 35 years experience unplugs a sink. Some prefer to use quick, repeated plunges rather than the slow single plunges demonstrated here. If you’ve already tried drain cleaning chemicals, then don’t use a plunger. You could potentially splash corrosive chemicals on yourself or your bathroom. Your sink will have a P-trap below it, which is where the drain pipe goes down and then comes up again (the purpose of this is to leave a layer of water in the drain that will prevent sewer gasses from entering your home). The bottom of the P-trap is a common location for clogs. If you’re a bit handy, you should be able to remove and clean out the P-trap yourself. For many types of traps, all you’ll need is a bucket to catch any water that comes out when the trap is removed. But for some types, you’ll need a pair of water pump pliers. A P-trap is a dip in the drain pipe that is a common location for clogs. The below video shows how a P-trap can be removed. It is not uncommon for hair and other items to become stuck to the stopper and slow down the drain. Fortunately this can usually be removed and cleaned without any tools. The video below shows how. After you remove the stopper, you may be able to remove any nearby blockages with an untwisted coat hanger. If you’ve already tried cleaning the P-trap and plunging the sink, this probably won’t solve your problem, but it’s worth a try in some cases. We usually don’t recommend drain cleaning chemicals. Not only are they bad for the environment, they’re also dangerous. Using corrosive chemicals might also lead to additional charges if you have to call a plumber, as extra care will have to be taken and the equipment will have to be washed extra thoroughly after cleaning the drain. This is especially the case when dealing with a complete blockage (as opposed to a slow drain). One less hazardous (but still requiring caution) method is adding baking soda and vinegar, followed by warm water. This can clear some blockages. Grease is the worst substance when it comes to clogging drains, so it should never be poured down a drain. If you think your drain might be clogged with grease, one thing you can try is pouring dish soap down the drain. Dish soap is specially made to break up grease. See how in the video below. If these tips don’t work, call 604 GOOD GUY (604 466 3489) to schedule a service call, or use our online form. When electronic air cleaners (EACs) started to become popular about 15 years ago, they were hailed as a highly effective and economical way to clean indoor air. However, more recently, they have been criticized for their production of ozone (a lung irritant) and because they require regular cleaning (which many homeowners do improperly or not at all). For these reasons, most major heating & air conditioning manufacturers have stopped promoting them, and switched back to high efficiency media filters. But some still believe EACs are a good solution due to their overall effectiveness and relatively low maintenance costs. A well known vacuum cleaner company has been promoting a tabletop EAC using TV infomercials. However, for homes with ductwork, we recommend EACs that hook up to your furnace, as they can provide whole-house air cleaning with only a single system. 1) A pre-filter removes large particles. These are usually made of a steel mesh, and can easily be cleaned under running water. 2) An ionizer gives the remaining smaller particles a negative charge. 3) The particles are collected on positively charged plates. 4) An activated charcoal filter removes odours and VOCs (volatile organic compounds). Many odour-causing molecules and other harmful compounds are too small to be removed by any filtration system, except for activated charcoal filters, which capture many of these compounds. This is the only part of the system that requires regular (usually annual) replacement, although it is optional. How an electronic air cleaner works: Particles are given a negative charge by an ionizer and are then collected on positively charged plates. Illustration by Evan Mason. An EAC can capture most particles as small as 0.1 microns (1/250,000 inch, smaller than most bacteria). A 1999 CMHC comparison of 10 different filter types found them to be highly effective, removing about 90% of particles. They were found to be the most effective, and were ranked #1 for value, because they can be used for many years without requiring replacement of any filters or other components (except for the odour-removing activated charcoal filters, as odours were not included in the study). CMHC Study comparing the effectiveness of furnace filter types. ESP (electrostatic precipitator) is another name for an electronic air cleaner. 1”MED = 25 mm pleated media high quality, 4”MED = 100 mm pleated media, and E.PAD. = electronic charged pad. The HEPA filter also had a very high efficiency (90%+), but the bars are shorter as only a portion of the total airflow was passing through the filter. A study showed EACs to increase indoor ozone levels by 7-10 parts per billion (ppb) on average. This compares to the EPA’s 80 ppb standard for declaring a “bad air day”, so it may be the case that the overall cost effectiveness of EAC’s still makes them a good option. Indoor ozone levels with the EAC running were still usually lower than outdoor ozone levels. However, ozone considerations may lead homeowners who are especially concerned with air quality to opt for other filtration systems. A more recent CMHC study showed that these filters must be cleaned regularly (as often as once a week) to keep them operating at top efficiency. You can see an EAC cleaning video here. Homeowners who are unable to regularly maintain the system should consider other filtration options. To see other options for whole-house air purification, visit our whole-house air cleaners post. For information about installing an EAC or other air cleaner type, call 604 GOOD GUY (604 466 3489) or use our online form. When buying a new hot water tank, one of the main questions homeowners ask is “which brand is the best?” Unfortunately, no major consumer publication (such as Consumer Reports) or surveying organization (such as JD Power) conducts brand reliability surveys. Consumer Reports just recommends to install a tank with a longer warranty, because ”sawing open a cross-section of gas and electric storage-tank models in our lab confirmed that paying a little more typically buys a better water heater. Those with longer warranties tended to have larger heating elements, thicker insulation, and thicker or longer corrosion-fighting metal anodes. ” However, since efficiency standards are higher in BC than the rest of Canada and the US, only the tanks with longer warranties (8 years) are available. 2006 JD Power Water Heater Subcontractor Satisfaction Study. This is the closest thing to an impartial reliability survey that can be found. Reliability, product quality, and warranty fulfillment were among the factors considered. The closest thing to a reliability test ever performed was a 2006 Subcontractor Satisfaction Study performed by JD Power. Some of the most important factors surveyed included reliability, product quality, and warranty fulfillment. Of the three major manufacturer’s, Bradford White finished first an Rheem finished a close second. Incidentally, these are the two brands we install (we install Rheem Energy Star gas hot water tanks and Bradford White tanks for other purposes). We have found both brands to be relatively reliable. Learn more about the hot water tank models we install on our hot water tanks page. To schedule a hot water tank replacement or repair, call 604 GOOD GUY (604 466 3489) or use our online form.